Just when it seemed that new discoveries of extrasolar planets couldn't possibly get more exciting, three exoplanets have been detected that could top the charts for some time to come. Why the fuss over these exo-worlds? In a nutshell, all three of them are about the size of Earth, are close to their star's "habitable zone," and in fact orbit the very same star, only 40 light years from us—an extreme close-up by astronomical standards. A star's habitable zone, also called the "Goldilocks Zone," is the region where liquid water could exist on a planet's surface—not so close that the water would boil away, and not so distant that it would freeze. In other words, just right. 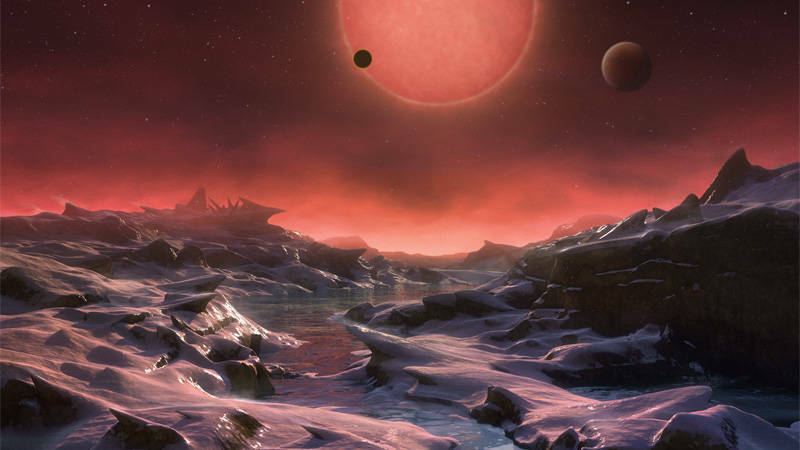 All of this adds up to make this exoplanetary system the best place we've found to search for signs of life. 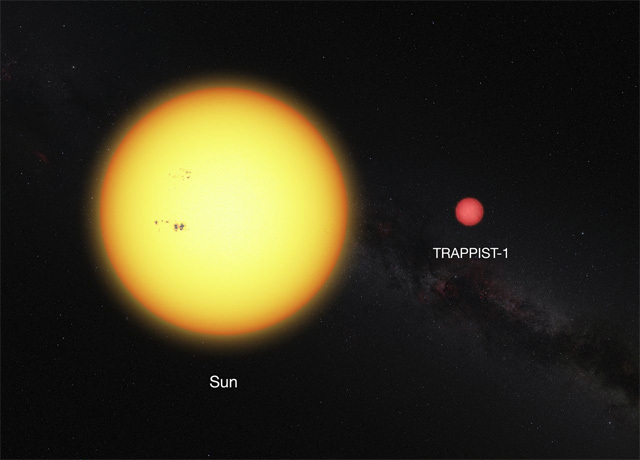 The star, named TRAPPIST-1, is a very small, ultra-cool red dwarf, not too much larger than the planet Jupiter. This type of dim, low-mass star is very common in the galaxy, but this is the first detection of planets orbiting one. The discovery was made by astronomers using the Belgian "TRAPPIST" telescope at the La Silla site of the European Southern Observatory, in Chile, who detected brief intervals when the star's light dimmed, indicating possible planets passing in front of it—or "transiting." Follow-up observations confirmed the presence of three planets, and that they were small, Earth-sized bodies. Two of these planets zip around their star in a mere 1.5 and 2.4 days, respectively, telling us that they are very close to their sun--maybe a bit too close to be fully within the habitable zone, though the possibility of water-friendly regions on their surfaces cannot be ruled out. Is There Life In The Twilight Zone? Being so close to their star, these planets are probably "tidally locked" to it, with the same side always facing toward sunlight—not unlike how our moon always presents the same face to the Earth. A situation like this might allow for a balance between extremes, creating temperate conditions somewhere between the perpetually day-lit side and the side of unending night, a realm of constant twilight—and maybe in a crossfire of weather conditions generated by the opposing hemispheres. The period of revolution of the third planet is still in question; it may be anywhere from 4.5 to 73 days. Depending on the answer, this one could lie well within the habitable zone—something that further observations might reveal. Not only do their Earth-like sizes and moderate, possibly water-friendly temperatures make them potentially suitable environments for life as we understand it, the nature of their star itself increases our chances of making that discovery. 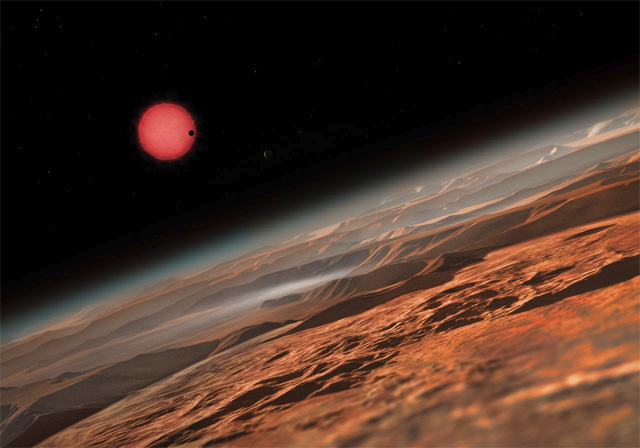 Because TRAPPIST-1 is such a faint star, astronomers can make measurements of the exoplanets' atmospheres (if they have atmospheres) that are not yet possible with brighter stars—stars like our sun. Subtle effects on TRAPPIST-1's light as it passes through a planet's atmosphere can be measured, which could potentially reveal clues about any life that might exist there. At forty light years, TRAPPIST-1 and its entourage are right in our sun's stellar neighborhood, practically at its front door. Yet, by the standards of our current space-flight technology, it is still well beyond our physical reach. Even a speedy robotic probe moving at a tenth the speed of light (still well beyond our present means) would take 400 years to get there. But as Yogi Berra famously pointed out, "You can observe a lot by just watching" -- and the watching will get better with further advancements in technology. With the future launches of Kepler's exoplanet-hunting successor, TESS (2017), and the Hubble Space Telescope's replacement, the James Webb Space Telescope (2018), powerful new observational technologies will be brought to bear on the question of exoplanets, habitable environments, and the potential for life. The first detection of an exoplanet was made in 1992, when the available technology allowed only the observation of large, Jupiter-sized planets orbiting close to their stars—so called "hot Jupiters." Advancements and refinements in techniques and technology over the last two decades have expanded our reach into the realm of our galaxy's exoplanets. Our ability to detect and study smaller, Earth-sized planets orbiting farther from their stars in habitable zones has blossomed, especially with the launch of NASA's Kepler spacecraft. Prior to 1992, we didn't know if the formation of planets around other stars was a rarity, or commonplace—and now we know: planets are about as common as dirt, even planets with potentially Earth-like conditions. As of July 2015, Kepler alone has verified the existence of 1,284 exoplanets, and 1,327 other candidates that are very likely planets as well. This brings the grand total of confirmed extrasolar planets to over 2,000, with thousands of other candidates awaiting confirmation. That's a lot of territory out there.